Posted on January 19, 2017 , in Swim Spas. Because swim spas allow you to exercise, relax, and have fun all in one package, they are becoming more and more popular. If you don’t know much about swim spas but are interested in investing in one, below you’ll find out more about the basics of swim spas and what to look for to make the best decision. When you want an outstanding cardiovascular workout that doesn’t cause pain to your joints, a swim spa is a great choice. Even users who suffer from arthritis are able to exercise comfortably in a swim spa. Most swim spas have adjustable currents that vary from 2.5 to 8 mph and allow you to increase or decrease the speed to challenge yourself. The direction of the water as it exits the jets can also be adjusted. If you’re a serious athlete, you can challenge yourself by adding a heart-rate monitor, rowing machine, swim meter, resistance cord, aqua bikes, weight bar, or other accessories. There are many different kinds of swim spa systems. Two propeller models allow two swimmers to swim simultaneously at different speeds. Other models include propellers at the front of the swim spa and create a current by pushing out water. There are also swim spas that feature paddle wheels at the back, drawing water toward them to create a current. No matter which type of system you choose, you want to make sure it distributes water evenly and allows you the ability to adjust both the flow and the current so you can challenge yourself as you improve. While swim spas provide exceptional fitness opportunities, they are just as great for relaxing, socializing, and alleviating pain and stress in your muscles through hydrotherapy. Whether you are an arthritis sufferer, an athlete, or need a way to unwind after work, a swim spa can help. If you want the ability to relax while another user exercises in your swim spa, look into a model that features dual heaters. This feature allows you to set different temperatures and have a hot tub in one area and a cool water swimming lane in another. 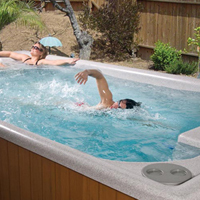 Because swim spas are incredibly compact, it’s easy to locate them indoors or outdoors. They are also portable and can be taken with you if you move to a new home. If style is important to you, it’s easy to customize a swim spa to fit. With a range of styles and colors for liners, shells, and cabinets, you can easily find an option that fits your home’s style. There are also many options for materials including fiberglass, aluminum, wood, acrylic, thermoplastic, stainless steel, and more. In addition, steps, tile, decks, ramps, and railings can be customized. Safety and entertainment features like stereos and security alarms can also be added. Now that you have a clearer picture of the basic features of a swim spa, download our free buyer’s guide to learn more about the wide variety of swim spas available.